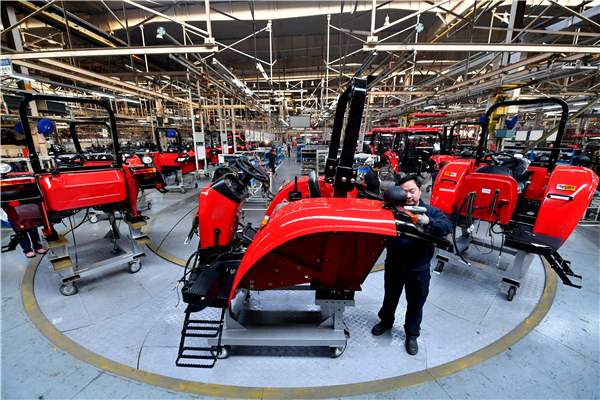 Services continued to show strong growth momentum and edged past manufacturing to account for the lion’s share of the economy in China during the first six months of the year, according to the latest economic data released by the government on Wednesday. The services sector accounted for 46.6 percent of the economic output in the first six months of the year, up 1.3 percentage points from the same period last year, and outweighed the manufacturing sector by 0.6 percentage point. Sheng Laiyun, spokesman for the National Bureau of Statistics, said on Wednesday it is becoming increasingly clear that the Chinese economy is becoming more service-oriented and less reliant on manufacturing. Sheng made the comments at a government briefing at which the NBS said the Chinese economy grew by 7.5 percent during the second quarter. “This trend will have deep and long-lasting impact on China’s growth and is worth high attention,” Sheng said. The services sector posted strong performance in the second quarter. The services purchasing managers index compiled by HSBC/Markit rebounded to 53.1 in June from 50.7 in May, the highest reading in 15 months. A reading above 50 indicates expansion in activity. Lin Caiyi, a senior economist with the Shanghai-based Guotai Junan Securities, said the services sector will continue to account for most of the economic output in the next six months. “It is hard to see a substantial rebound in manufacturing activities during the next six months due to the ongoing capacity reduction,” she said. NBS’ Sheng said that a bigger services sector would lead to slower growth, as the sector has a shorter industrial chain and is less responsive to investment. “In the short term, growth in the services sector could be inadequate to make up for the slowdown in the industrial sector, and thus result in slower growth,” he said. But, he said, the services sector generally employs more labor and is less subjec to external circumstances, which in turn ensures more stable growth. The rise of the services sector comes as China commits itself to making structural changes in its economy. Years of unbalanced growth have resulted in excess industrial capacity, regional wealth gaps and asset bubbles, making it hard for the country to continue its rapid pace of growth. In November, the government unveiled a 60-point plan that included financial and fiscal reforms, with one of the goals being to let the services sector play the lead role in the economy. Policymakers had indicated that these measures will produce “decisive” progress by 2020, when the economy will grow on a more balanced and sustainable basis. This year is widely considered a key year in determining whether China can succeed with its structural reforms. Analysts expect that the government will accept slower growth as it presses ahead with more reforms.